After indulging ourselves a bit too much with beautiful food and cocktails during our Hawaiian vacation we decided it was time to burn some calories. 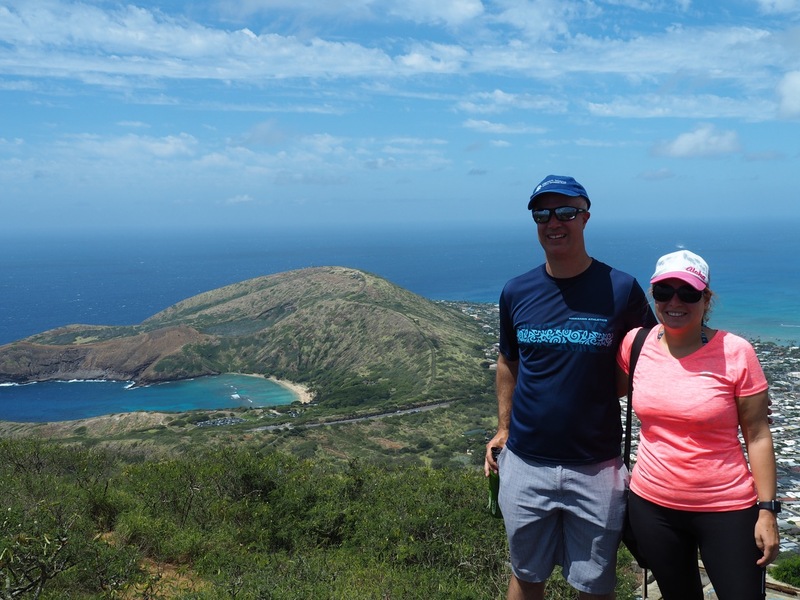 So on our way down from Oahu’s north shore to Waikiki at the end of our trip, we made a pit stop at Koko Head. 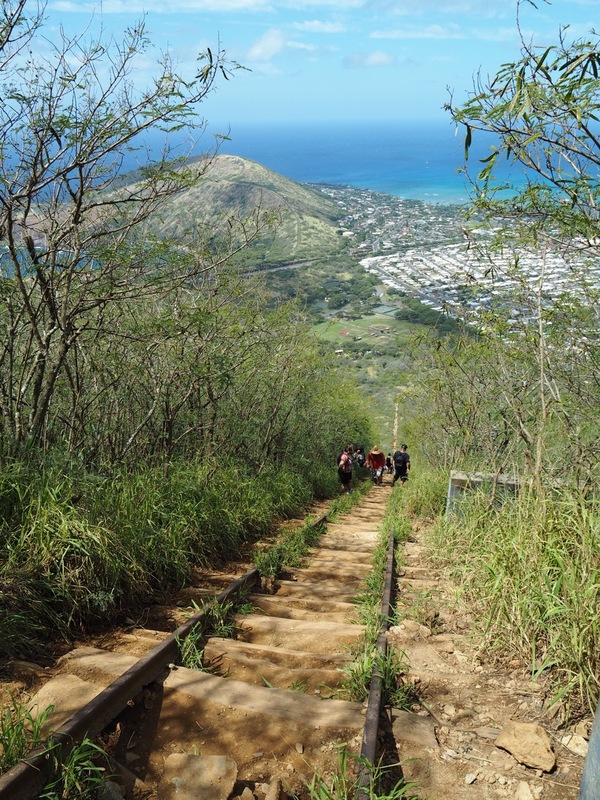 We’d heard that hiking up the Koko Head Trail made for some great exercise. It sounded like the perfect thing to do, a tough workout with some amazing panoramic views as our reward. 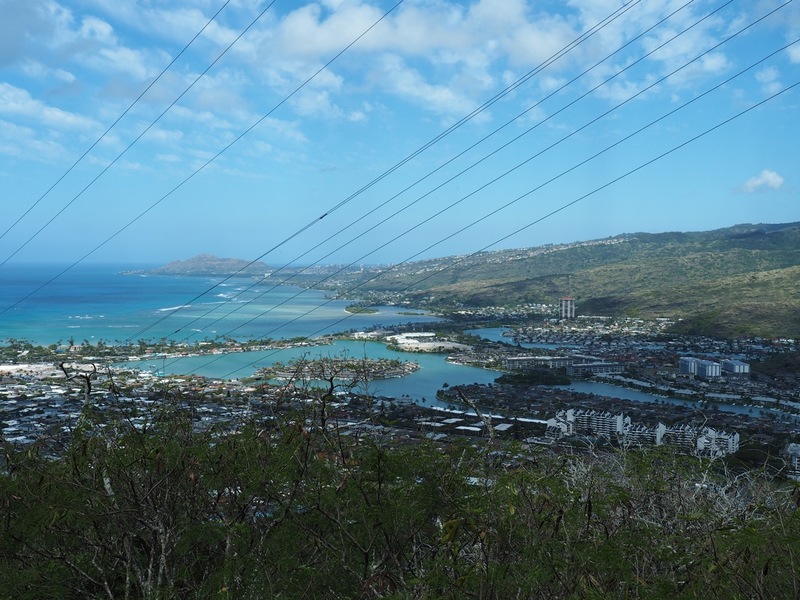 Koko Head from the lookout point. We knew then it would be a painful hike! 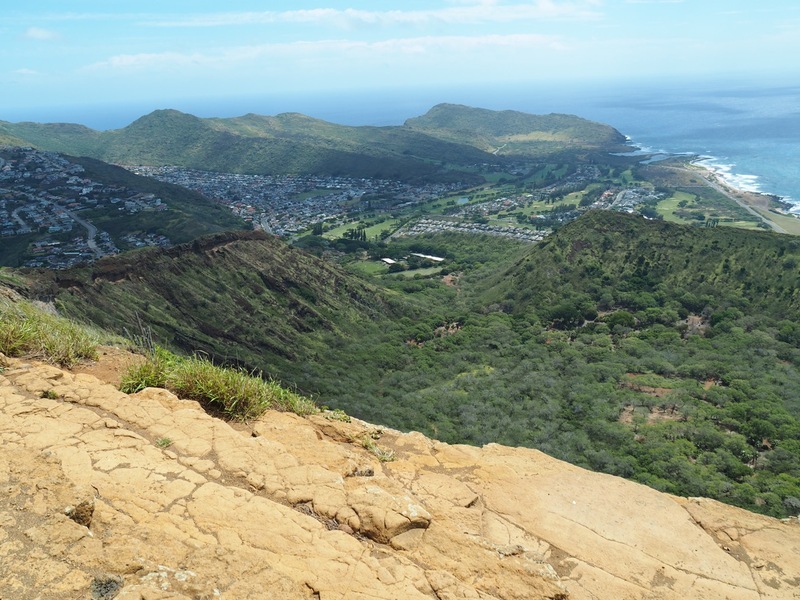 The Koko Head Trail is found thirty minutes drive east of Waikiki, right next door to Hanauma Bay. 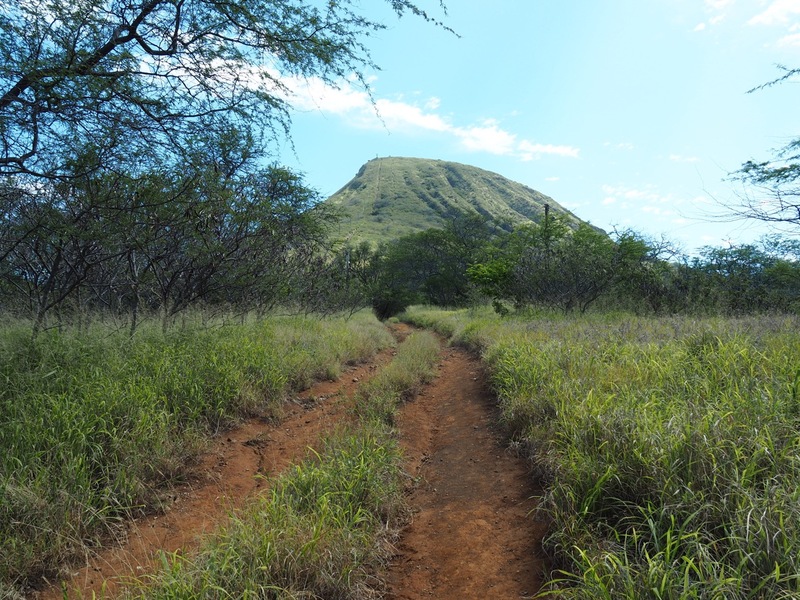 If you’re driving, there is plenty of parking at the Koko Head District Park parking lot, adjacent to the crater. 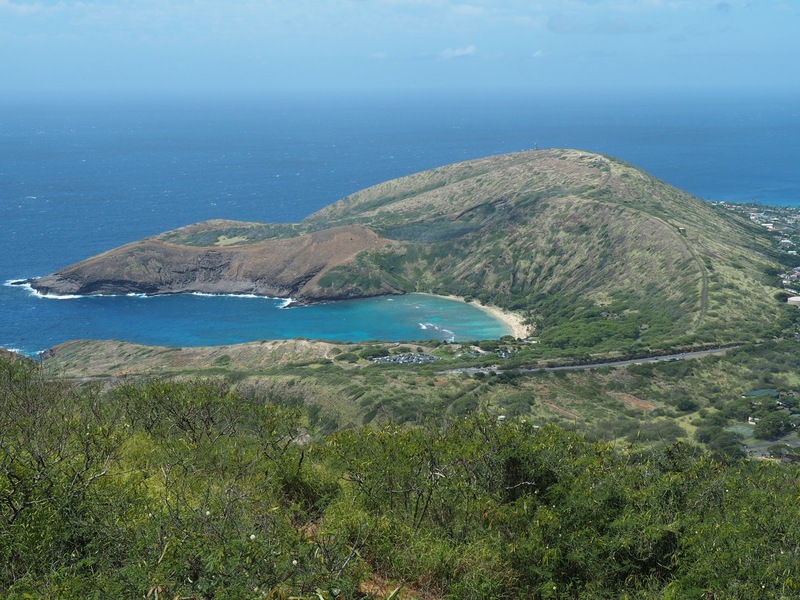 You can also take “The Bus” #22 or #23 from Waikiki, getting off at the Hanauma Bay stop and walking from there. Walking from the car park to the trail head. 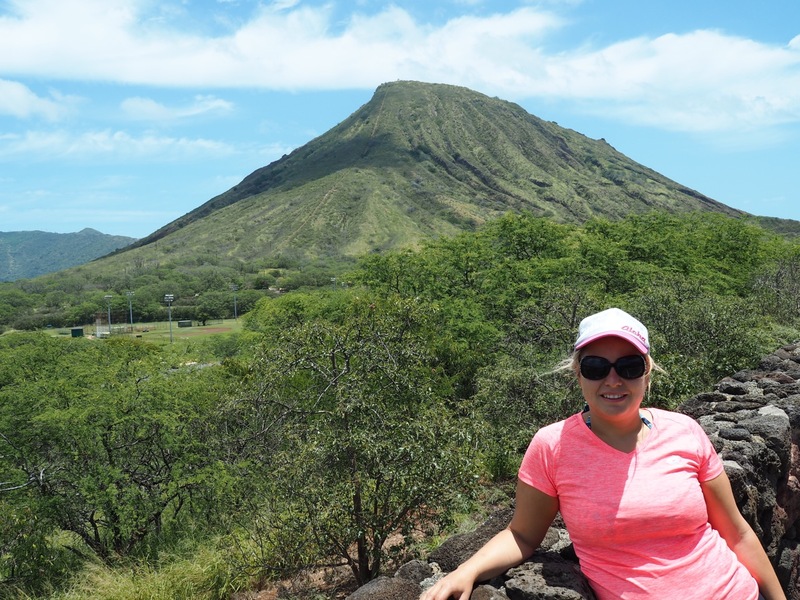 The Koko Head Crater is twelve hundred feet high. In World War II the army built pillbox lookout bunkers on top of it to watch for the enemy. To haul supplies up to those bunkers they built a railway up the side of the crater. 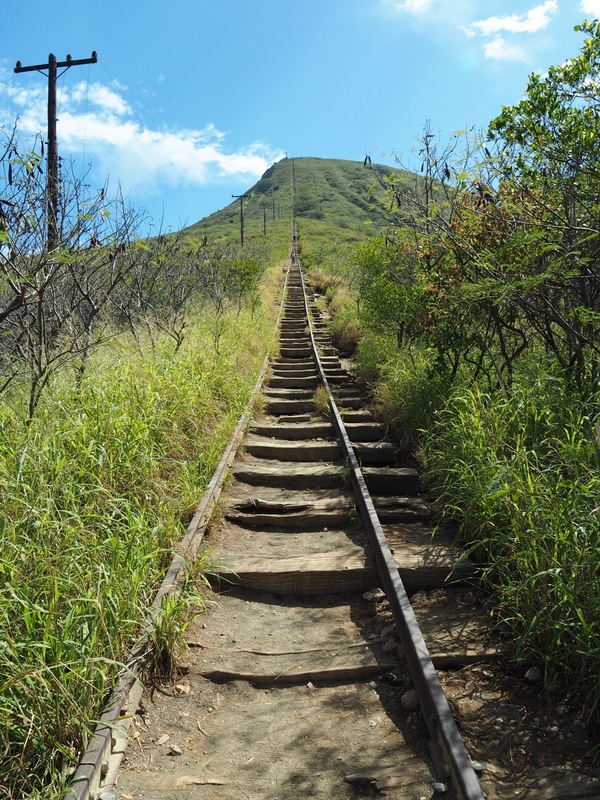 Nowadays, this old track is used as a staircase and a torturous one at that! 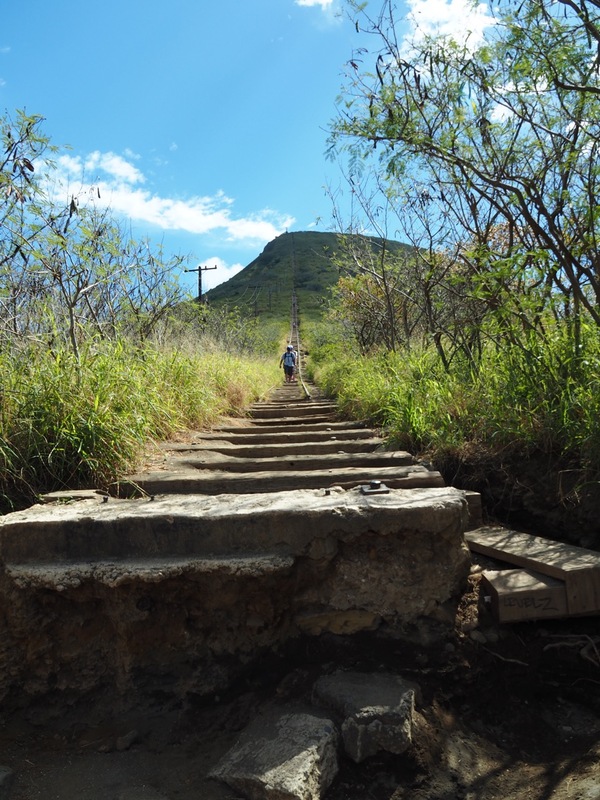 Many locals regularly climb this staircase in order to keep fit. A stern warning sign at the start of the hike. 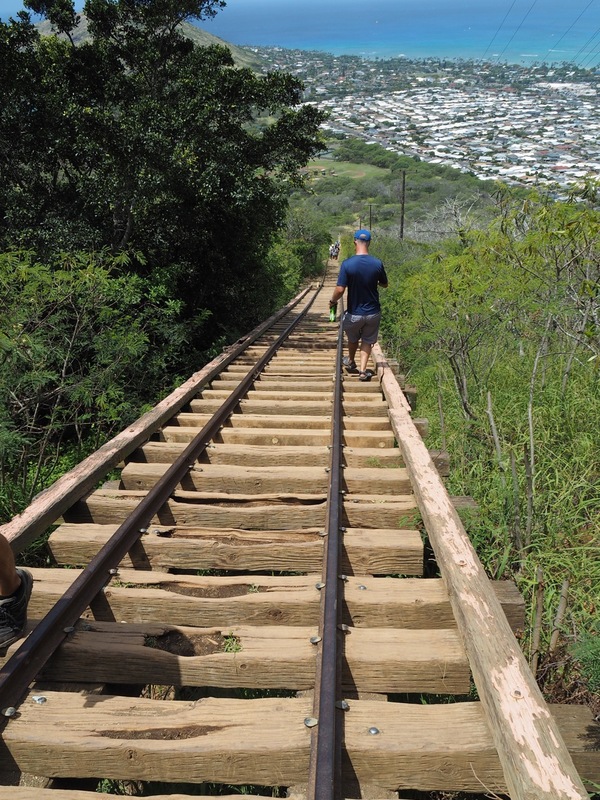 The hike consists of 1,048 steps, or more precisely railroad sleepers. Looking up from the bottom it doesn’t seem too bad, but wait until you start to climb! The steps are quite high and because I’m quite short it felt like I was having to take two at a time! I almost had to drag myself up some of them with the help of my arms (hey I am only five feet tall!). It doesn’t look too bad at first but it’s a killer! At the base of the crater there is a firing range and at the start of the hike, we could hear the sounds of gunshots very clearly. But after a few minutes of climbing all I could hear was a voice in my head blasting me for even starting that stupid hike! But fortunately, it didn’t take too long until we’d climbed high enough to get some amazing views. They began to make the pain seem worth it! The first views start to emerge. Those views kept us going to the top. As if climbing up all those steep stairs wasn’t hard enough, about half way up a surprise lay waiting for us. 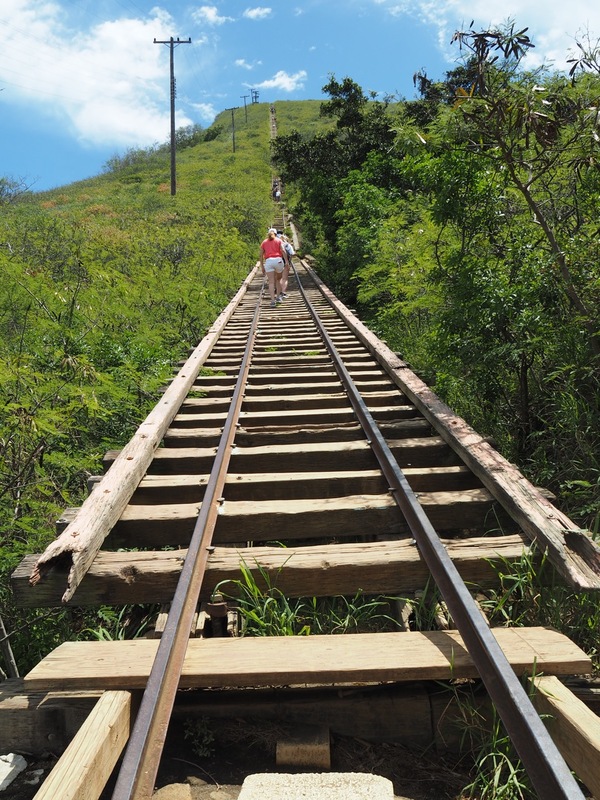 A section of the track passes through a small valley, forcing you to walk about fifty feet of track with gaps between the sleepers and a forty foot drop below. Some people were doing this on their knees. There is also an alternative safer path around to the side if you are scared of heights. The scary section of the hike! We decided to carry on across the bridge since I figured that I wasn’t scared of heights. I mean I’ve never really worried about standing at the edge of cliffs, and I’ve taken doors-off helicopter rides with no worries at all. But I don’t know what came over me; I freaked out on this part of the trail and a few steps in I just froze. That was embarrassing! I couldn’t go any further until Simon grabbed my hand to steady my nerves! Seems I’ve become a scaredy cat in my old age! Half way through…. Still so many steps! The second half was so tough. We had to stop a few times for water and to catch our breath, but we eventually made it up that last step. What a relief it was. We were both drenched in sweat and my legs felt like jelly. Of course, the top of the track isn’t quite the top of the crater. 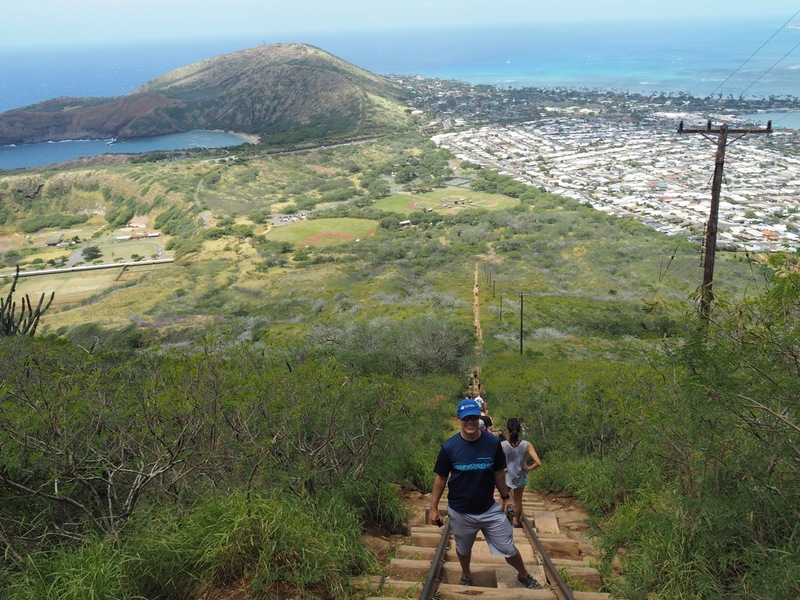 There is another small path to hike up before you hit the summit. 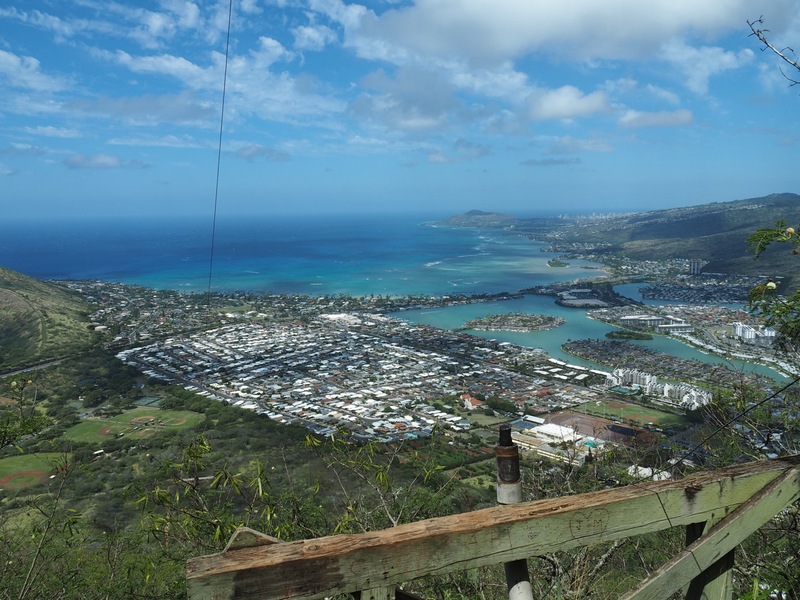 But once there you’ll be blessed with panoramic views all the way from Diamond Head to Makapu’u Pt. Yes, it’s certainly a treat after all your hard work! The view from the last step! The view from the path to the summit. Some more incredible views from the top. After recovering a bit and enjoying the gorgeous scenery we made our way back down the same track. The way up was tough and the way down was, of course, a lot easier. However, it was slippery at times and we had to be extra careful where we placed our feet. I reckon you’re more likely to twist an ankle or fall on your way down because your legs are tired and mentally you’re not as focused. Now to make it back down! Those big steps were also tough on the knees, especially for shorties like me! Turns out it took us almost as long going down as going up! Oh by the way, on the way down I chickened out and took the side path rather than cross the bridge again. 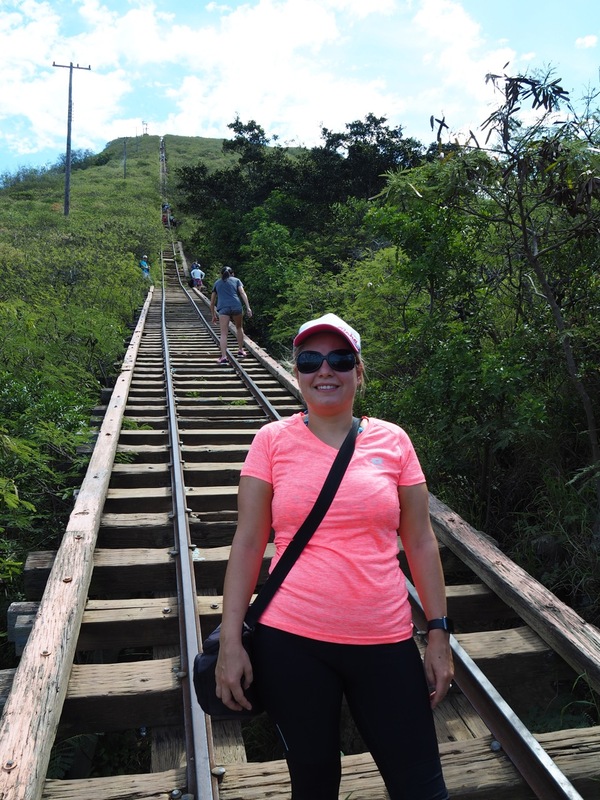 I didn’t think tackling it with my jelly legs was a bright idea, particularly since I’d barely managed it on the way up! Simon going crossing the bridge again; he wasn’t scared at all! I took the alternative route on the way down! 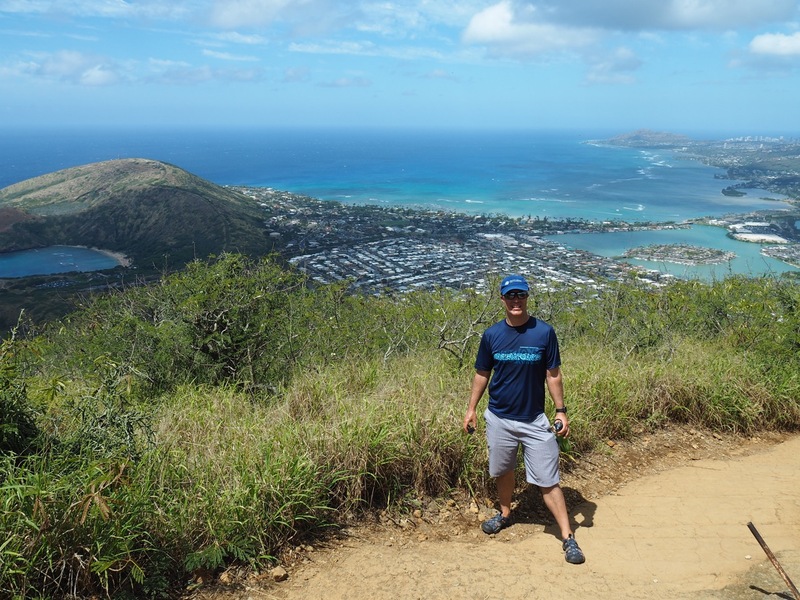 The view of Hanauma Bay from the Koko Head summit. 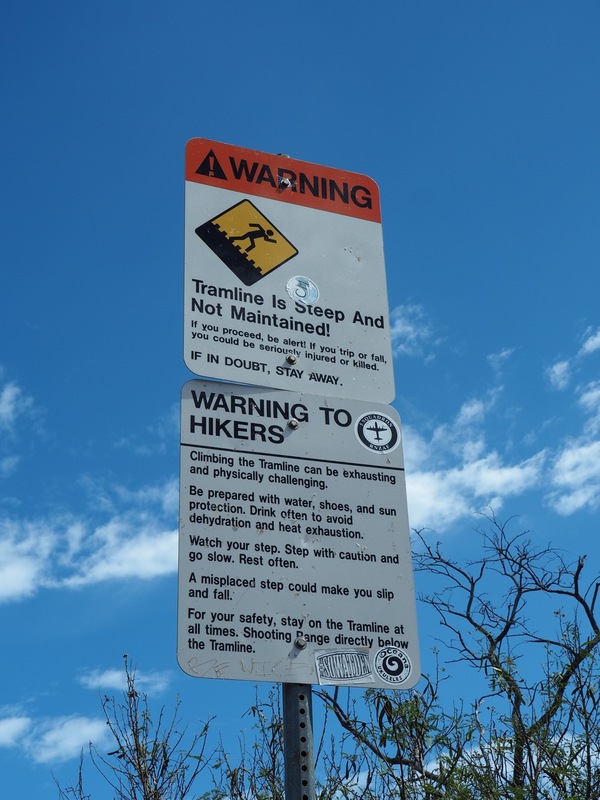 Let faster hikers safely pass you. Some of the locals know the path well and they’re a whole lot quicker than us tourists! Take plenty of water with you, you are going to need it! Wear sturdy shoes with good ankle support. Bring a hat and use sunscreen, it gets really really hot! Start the hike first thing in the morning if you can, before the sun gets too hot. It is also less crowded at that time. Don’t plan any other hikes for the next few days unless you’re a seasoned hiker. I had very sore legs for five days after this hike! Sitting on a long haul flight back to Australia with sore legs wasn’t much fun, but the views were so worth it that it I’d do it again tomorrow! Thanks so much. Hope you enjoy it as much as we did. 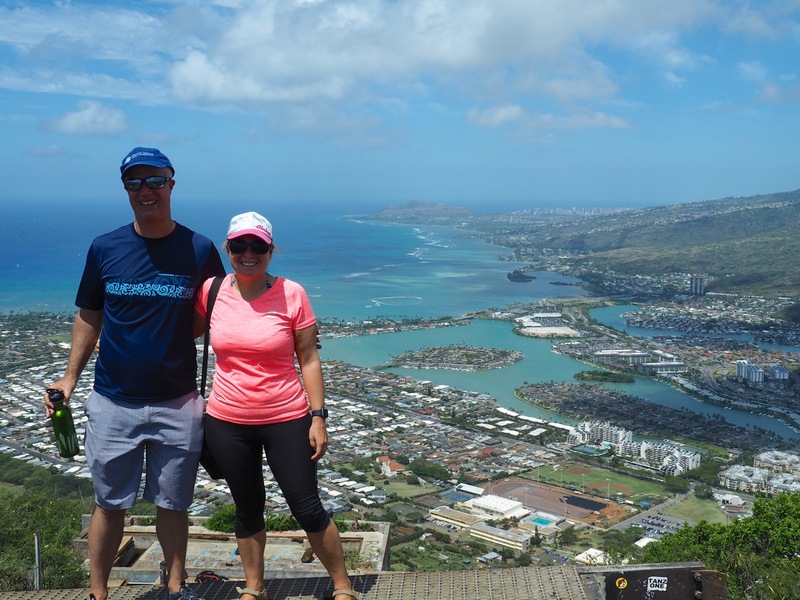 Pretty grey in Melbourne too at the moment… We miss Hawaii a lot! This looks like a hard place to get to but those are always the best ones and the views look amazing! !